Home>Knowledge Base>What are your shipping policies? What are your shipping policies? Please read the shipping FAQs and accept the shipping policies before you submit your order. Note: As a measure of security for our customers while shopping on line, please be aware that when shipping to an address other than that listed as the billing address on your credit card account, we do call your credit card's issuing bank to verify the validity of the address. How much does shipping cost and How Shipping Charges are Calculated? What are the FedEx Shipping methods you have? Will I get a tracking number for my order? I placed my order for “FedEx Overnight Delivery”. Will I receive it on the next day? Why can't I track my package? I have used the USPS's tracking number to track my package on-line but there are no info on my package, what's going on? Why does it say no tracking info available when I track via usps.com? When I track my package, it states the following: "The U.S. Postal Service was electronically notified by the shipper or shipping partner on _______ __, ____ to expect your package for mailing." What does this mean? I ordered memory and had it shipped via USPS. It never arrived! Can I have a refund? Do you ship to Hawaii and Alaska? Do you ship to Puerto Rico, Guam, and US Virgin Islands? Shipping is calculated based on the zip code of the destination. Shipping charges are calculated in real-time for orders shipped within the United States, via FedEx, Priority Mail. Shipping charges are calculated and presented to you in real time during the ordering process, allowing all charges to be known before you complete your order. We do not use a one-charge fits all pricing policy. The shipping charge shown on your invoice when you check out is the actual cost to ship the package to your door. The majority of the packages we ship are through FedEx, and the US Mail via Priority Mail*. International orders are currently shiped using USPS. Shipping charges are calculated and presented to you in real time during the ordering process, allowing all charges to be known before you complete your order. The rates shown for FedEx reflect almost 50% discount off the standard FedEx rates. We encourage you to take advantage of these great rates by using FedEx premium delivery service. We will automatically notify you via e-mail when your order ships and include the FedEx, tracking number of the package(s) in the message. Our preferred carrier is FedEx. FedEx is the most reliable and trused shipping service we recommend to you. The FedEx rates shown on our web site reflect substantial discounts over the published FedEx rates. FedEx Standard Overnight: Next-business-day delivery by 3 p.m. to most U.S. addresses; by 4:30 to rural areas. FedEx 2nd Day: By 4:30 p.m. in 2 business days to most areas (by 7 p.m. to residences). FedEx Saver: Delivery to businesses by 4:30 p.m. and to residences by 7 p.m, in 3 business days. When we ship your package through FedEx you will receive an e-mail with your tracking number. We send a tracking number email for every order we ship via FedEx. If you placed an order and requested FedEx service you will receive an email to the email address you provided us when you placed the order. Take that number to our "Track your Package Page" and type in your tracking number. You will then be able to find out where it is and when it will arrive. If you placed an order for “FedEx Overnight Delivery” during the work week (Monday – Thursday) before 3:00 PM Central time, then you will receive your order the next day. If you place your order on Friday for “FedEx Overnight Delivery”, then your order will be shipped on Friday, but will be delivered on the next business day - Monday. FedEx does not deliver on Sunday. For FedEx Ground, a business day does not include Saturdays,Sundays, or holidays. Example: We ship a package on Monday that takes 2 business days to arrive. We do not count the day we ship as a business day, so your package would arrive on Wednesday, the second business day after the ship date. Our USPS shipping services are shipped with delivery confirmation. This means that the only time you can "track" your package is once it's delivered. It is not uncommon for packages to not show an origin scan and only confirmation of delivery. If you have chosen USPS Priority Mail as your shipping method, please be aware that the US post office provides for most destinations a delivery confirmation service, not a tracking service, for Priority Mail shipments. With tracking service, packages are scanned at acceptance, in transit and at delivery. USPS delivery confirmation services are designed to be a low cost alternative to full tracking and primarily provide delivery information. Confirmation of delivery or attempted delivery is provided. Information is generally available on the evening of the date of delivery or attempted delivery. If your order ships via the post office (USPS), your tracking information will not be available until your order has been delivered. This is actually delivery confirmation information you are trying to access as the post office does not offer tracking. 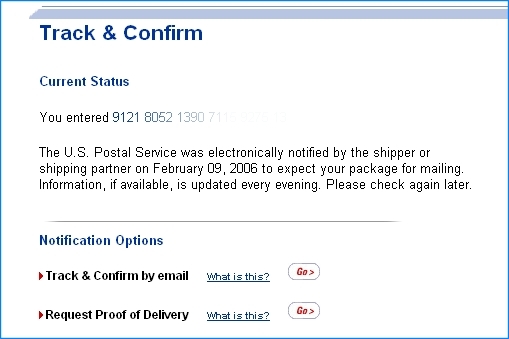 This is a sample screen of what it shows when you enter your tracking number on USPS. If you have seen this message for many days, this means your package has been dropped off and USPS did not update an origin scan. Short answer: Not unless it is returned to us by USPS. Long answer: We've seen a lot of abuse of our USPS shipping service recently, so we will no longer issue refunds or replacements for ANY orders sent via USPS, that are "lost in the mail" and that are NOT returned to us by USPS. USPS shipments have no tracking numbers. Customer complains that package never arrived. Of course, because there's no tracking number we cannot prove it arrived or not. Being good businesspeople we send out a free replacement via FedEx. Hundreds of people do this. We lose a lot of money. We have to change our policy. We are not removing the option to send orders via USPS. However, because of the actions of a large number of dishonest people, we have now adopted the policy that by selecting USPS as your shipping method you do so at your own risk. Yes, we do. 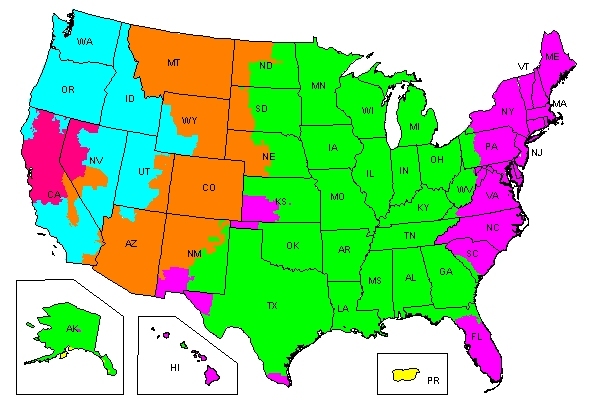 We use FedEx and USPS to deliver to Hawaii, Alaska and other non-continental US addresses. However for USPS we cannot guarantee the delivery days. We recommend you to use FedEx service for shipping to Hawaii, Alaska non-continental US addresses. Yes, we do. We use FedEx and USPS to deliver to Puerto Rico, US Virgin Islands, and other non-continental US addresses. However for USPS we cannot guarantee the delivery days. We recommend you to use FedEx service for shipping to Puerto Rico, Guam and US Virgin Islands. Yes, we do. We ship to APO and FPO addresses using US Postal Services (USPS). Please choose the "USPS for A/FPO addresses" shipping method. We charge shipping and handling according to shipping zone .We also offer Free of charge shipping and handling via US post office (United States Postal Service) if customer is willing to buy insurance. USPS First Class packages get lost more frequently compare to any other shipping method therefore we insure all packages shipped via USPS First Class Mail. All USPS Priority Mail shipments will be considered lost if they have not arrived after 10 business days via USPS, and all First Class packages considered lost if they have not not arrived after 21 business days. If delivery or signature confirmations show the package is delivered you will be required to work with your local carrier to determine the package whereabouts. If you have purchased insurance from us we will reship all packages which have not arrived after 10 business days for FedEx Ground, and USPS Priority mail and after 21 days for First Class mail. FedEx will not deliver to a P.O. Box - please indicate a shipping address and phone number. We are not responsible for a wrong address so please carefully check the name, address and zip code of the recipient. Incorrect or incomplete addresses may be assessed a $10 surcharge after delivery if such charges are billed to us. FedEx requires a signature for all orders above $200. All orders shipped to businesses will require a signature, shipments will be delivered to the address provided and need to be signed. We do our best to get your shipments to you in time. But once the package is delivered to USPS, FEDEX, it is out of our control. Please follow up with the respective shipping company method to track your order. We will not be responsible for late deliveries or lags in delivery due to USPS, FEDEX slowness and no refunds will be given in these situations. There will be no exceptions to this policy! Shipping department at Memorystock may elect to switch carrier and adjust your shipping cost without notice. Shipping and insured charges are non-refundable. International orders are shipped via USPS International or FedEx International Priority. Our prices do not include taxes, tariffs or additional fees assessed by your customs broker. Transit time varies by location but generally ranges from two to five days. Prices shown may vary at anytime and will not be updated daily, for latest shipping prices please use this link Click Here. The shipping cost paid to us is just that, what we are charged to get the package sent. Any incurred charges a customer might be expected to pay at the time of delivery is their responsibility. Some of these charges may include duties and taxes charged by your local government for importing a product. This shipping method will only cover our cost to mail the package. Any incurred charges a customer might be expected to pay at the time of delivery is their responsibility. Some of these charges may include duties and taxes charged by your local government for importing a product. MemoryStock will not pay for, or refund, any of these costs. Prices shown may vary at anytime and will not be updated daily, for latest shipping prices please use this link Click Here. We ship through USPS to the following countries. Our prices do not include taxes and tariffs. Customers outside of the United States may be required to pay these fees to the courier, as applicable, upon delivery. For example, Canadian customers will be assessed the 7% GST (Goods and Services Tax) or the appropriate HST (Harmonized Sales Tax) or PST (Provincial Sales Tax) when the order arrives. Any incurred charges a customer might be expected to pay at the time of delivery is their responsibility. Some of these charges may include duties and taxes charged by your local government for importing a product. MemoryStock will not pay for, or refund, any of these costs. Please consult your local customs office or tax authority for any cost specific to your location. SmarterTrack Enterprise 4.9 | Help Desk Software | © 2019 SmarterTools Inc.